The Dow Chemical Co. (DOW:NYSE), based in Midland, Michigan, is a multinational chemical corporation. More commonly known simply as ‘Dow’, it has been the world’s second biggest chemical manufacturer globally by revenue since 2007, and the third largest by capitalization since February 2009. Dow, which employs about 54,000 workers worldwide, makes chemicals, agricultural products and plastics and is active in more than 160 nations. Dow is divided into seven different operating segments, with each one manufacturing a wide range of products. For the year 2013, the company posted sales of $57.1 billion, a 1% increase on 2012. Sales increased in all geographical regions except for EMEA (Europe, Middle East and Africa). Thirty-five percent of Dow’s sales come from emerging markets. Most of Dow’s sales go to other industries rather than end-users. In the consumer products, human & animal health markets, however, it sells mainly to end-users. 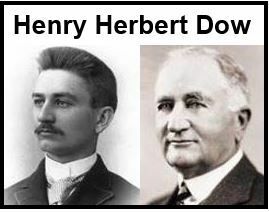 Founder of Dow Chemical Co., Henry Herbert Dow, as a young man (left) and aged 58. Basic Plastics: this segment represents 26% of the company’s total sales. The range of products made is vast and includes bottles for drinks, diaper (UK: nappy) liners, and oil tanks. Its products are based on three main polyolefins – polypropylene, polyethylene, and polystyrene. Performance Plastics: represents 25% of all sales. Its main clients are in the construction and automotive industries. Principle products include polyolefins, bisphenol A, epichlorophydrin, and PVDC (polyvinylidene chloride). Performance Chemicals: makes up 17% of total sales. This unit makes materials and chemicals for paper coatings, paints, advanced electronics, pharmaceuticals, and water purification. Dow’s wholly owned subsidiary, ANGUS Chemical Co., manufactures nitroparaffins for the pharmaceutical industry. Hydrocarbons & Energy: making up 13% of all sales, this segment monitors energy management at Dow. The unit also procures fuels & oil-based raw materials, plus major feedstocks for the company. Basic Chemicals: representing 12% of all sales. Products made here are used both internally as raw materials for the company and are also sold globally. Markets include the food, snow & ice control, dry cleaning, and paints & coatings industries. Agricultural Sciences: known as Dow AgroSciences represents 7% of the whole company’s sales. This unit makes herbicides, fungicides and insecticides, such as Lorsban. The unit has a rapidly growing genetically modified plant seeds business. The company sells seeds commercially under several brands, including PhytoGen, Hyland Seeds, Mycogen and Atlas. Water purification: DW&PS (Dow Water and Process Solutions) manufactures Filmtec reverse osmosis membranes for purifying water so that it is potable (drinkable) in the Middle East. The technology has been used in two Olympic Games venues (2000 and 2008). Herbert Henry Dow (1866-1930), born in Belleville, Ontario, Canada, a chemical industrialist founded Dow in 1897. At Midland, Michigan, he devised a new way of extracting the bromine that was trapped in underground brine. Initially, the company only sold potassium bromide and bleach. By 1902, it was producing 72 tons per day of bleach. At the beginning of the 20th century a group of British industrialists tried cut bleach prices in their quest to drive Dow out of business. Mr. Dow responded by cutting prices too and survived, but lost more than $90,000 in income. At that time he decided to broaden his portfolio of products. German bromide makers started dumping bromide in the US in 1905. Their aim was to undercut Dow, thus preventing him from expanding in Europe. He responded by buying their artificially-cheap bromide in the US and sending it back to Europe, thus expanding his business in the old continent. Over the next two decades Dow broadened its product portfolio and became one of the world’s major producers of magnesium metal, agricultural chemicals, elemental chlorine, phenol and other dye chemicals. When the First World War broke out, Dow began to replace German suppliers in the US for many materials, including those needed for the war effort. It produced bromine for tear gas and medications, magnesium for incendiary flares, and phenol & monochlorobenzene for explosive devices. By the end of WWI, more than 90% of the company’s total production included components for the war effort. In 1918, Dow created its famous diamond logo that it still uses today. After the war was over, the company’s magnesium research and development department developed refined automobile pistons that helped improve fuel efficiency and made cars go faster. Dow started manufacturing plastic resins in the 1930s, products that would eventually turn the company into a global giant. In 1935, it started making ethylcellulose, and then polystyrene in 1937. Dow completed construction of its first plant in 1941 in Freeport, Texas, where it produced magnesium extracted from seawater. Industrial historians say this was where the ocean was first mined by humans for metal. Apart from being Dow’s largest site today, its Freeport plant is one of the biggest integrated chemical manufacturing sites worldwide. The Freeport plant grew rapidly. By the time WWII broke out, Dow had become a strategically vital business for the war effort. It supplied much of the country’s magnesium for making lightweight parts for airplanes. The Dow Corning joint venture started producing silicones for military use during the war, and then civilian use later. After WWII, Dow started expanding rapidly outside North American. In 1952 it set up a subsidiary in Japan, and soon spread into dozens of different countries. In 1953, it set up a consumer products division, starting off with Saran wrap. 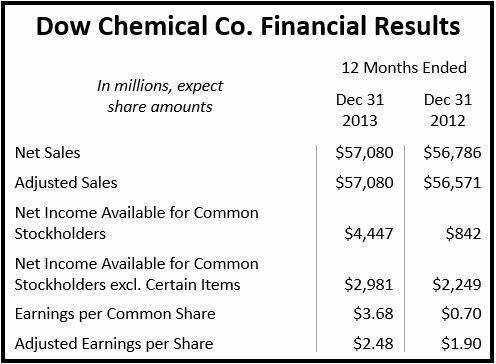 By 1964 Dow Chemical Company’s annual sales hit the $1 billion mark, then $2 billion in 1971. By 1980 the company had annual sales in excess of $10 billion. Atomic weapons: Dow managed the Rocky Flats Plant from 1951 to 1975. The Denver, Colorado facility produced plutonium, the element used in hydrogen bombs (a type of atomic bomb). In 2008, a court ordered Dow and another company (Rockwell) to pay $925 million in damages to citizens of Rocky Flats, near Denver, for environmental contamination caused by the plant. Another court reversed the decision in 2010. In the 1990s, Dow went underwent a major structural reorganization. The reporting hierarchy had been geographically based, with the head of each country reporting to head office. After the reorganization, reporting became division-based, i.e. the head of Polystyrene in Japan would report to the head of Polystyrene at headquarters. Regional presidents’ roles were nearly reduced to that of mere figureheads. In August 1999, Dow and Union Carbide agreed on a $9.3 billion acquisition deal. The acquisition turned Dow into the world’s second largest chemical company, after DuPont. Shareholders were concerned that Dow’s reputation would be stained by Union Carbide’s disaster in Bhopal, India. From 2006 to 2008 the company underwent another restructuring program. In 2006, Dow announced the closure of facilities in five locations. In 2006, a joint-venture was formed with Russian producer of polyurethane systems Izolan. Eventually a new facility was built in Vladimir. In 2007, the company said it was leaving the automotive sealers business. Not much later, it set up a joint venture (K-Dow) with the Petrochemical Industries Company, part of the Kuwait Petroleum Corporation. When the global financial crisis hit, the Kuwaiti government abandoned the venture. Dow sold a 50% stake in its polyethylene, polypropylene plastics, polycarbonate plastics, ethanolamines, and ethylenamines businesses for $9.6 billion. In 2009, Dow acquired Rohn and Hass Co. for $15 billion.